You can pretty much forget big data. Okay maybe let’s not completely forget it. But you can forget our previous (already arguably archaic) definition of what constitutes useful big data to the business. Today we need to focus on fast data. 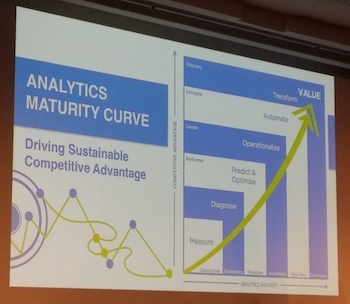 A little bit of spin here perhaps yes… but this is the message that TIBCO has pushed out at its ‘transform 2014’ conference in Paris this week. **What is fast data? ** The company known among the data connectivity cognoscenti as The Information Bus Company (hence the acronym), explains that so-called “fast data” is a combination of big data with real-time actionable information intelligence (up and) down cloud-driven conduits and channels. **What is the two-second advantage? ** This is an information technology notion (or data behaviour archetype) which suggests that a little bit of the right information, in context, immediately, is better than all the information (often big data) six months later. The term itself was coined by TIBCO CEO Vivek Ranadivé, an affable and approachable leader with a love for data analysis, basketball and maverick communications strategies. So take these two notions together i.e. fast data inside the two-second advantage… and you might be able to see where TIBCO is going. The firm is almost suggesting that big data is irrelevant to businesses today — if you don’t use fast data then don’t bother in the first place. TIBCO CEO Matt Quinn has said that big data (i.e. not fast data) has never really gained any “operational relevance” in the modern workplace. He goes further and suggests that the software application development within the more useful fast data space will mean the IT agenda will dictated by the Line of Business rather than by any strategy set by the CIO or CTO. **A real world example? ** So fast data inside the world of the TIBCO two-second advantage might see us analyse a consumer shopper’s behaviour as they walk around a department store using Internet of Things connection points to the individual themselves. Indeed, Quinn himself has suggested that our next data integration responsibilities will see us work to harness that information emanating from the Internet of Things. Even if we only have 80% of the information about that shopper (but we have it immediately, or in two-seconds) then that’s better than us having the remaining 20% as well later on. The shopper has left the building, the business decision opportunity has gone. The implications for where this approach can be deployed go further than retail; TIBCO has electronically tagged doctor hand washing in hospitals and correlated that activity with patient health. It’s no good having that information later on. We need it within two-seconds, or at least we need some of it. If we wait then the patients don’t get well… or worse. 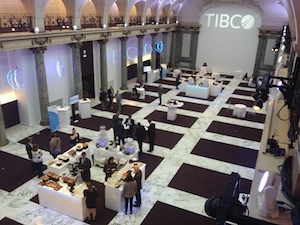 **Product expansions** The TIBCO transform 2014 event itself was staged in Paris. Those that weren’t drinking Laurant Perrier for lunch will have also noticed that the company used this conference to launch the latest iteration of its log management platform LogLogic Log Management Intelligence 5.5 release. This is intended to boost operational control of insight derived from machine data for enterprises around the world. LogLogic Log Management Intelligence 5.5 acts as a centralised source for enterprise log and machine data **What is machine data? ** Machine-generated data is widely agreed to be defined as that information created automatically as a result of a computer process, software application process or other machine — without the intervention of a human. According to sqlstream, “Machine data contains a wealth of information on customer and consumer behaviour and location, consumer quality of experience, financial transactions, security and compliance breaches, as well as the state of industrial processes, transportation networks and vehicle health.” Back to LogLogic 5.5 then… this product bids to allows firms to use machine data management to act and respond when identifying event and log data issues related to compliance, IT operations and security. “The ability to scale easily and automatically find, filter and forward the right machine data to the right applications and individuals is vital to businesses and MSSPs, especially as we transition into a mobile-first web experience,” said Frank Brown, business development, cloud solutions, Versatile Technologies. “Many of our customers process machine data from a vast number of sources and for different purposes – some managing as many as one million events per second,” said Craig Hinkley, vice president and general manager, TIBCO. “LogLogic 5.5 offers a real-time machine data management platform focused on providing operational advantage with industry-leading ease of deployment and faster time-to-insight than ever before,” added Brown. **So where do we stand? ** If we buy TIBCO’s brand of big data theorising… then we can say that we need big data to move onward and embrace the notion of fast data — further, we can say that the analysis of this fast data needs to be done within a two-second (or real-time) time window in a manner that integrates with applications designed and driven by actions as prescribed by the Line of Business rather than (but not necessarily excluding) the core IT function which of course still remains — and that this new reality spans all verticals with much closer connection points to the Internet of Things and machine data at a granular level.